Prof. Dr. Wang Jian, the first author of this book, was born in Beijing on 13 th October, 1958. He currently works in Agricultural University of Hebei, Baoding, P.R.China as a Professor. He has 110 graduated master students, 11 Ph.D students, published 18 books and more than 190 academic research papers. And he has got so many awards, honors and has the exposure to present the research papers in national and international conference. The main Scientific Research areas are Agricultural Development Programming, Environmental Protection, Agricultural Sustainable Development, Rural Information System and Network Construction, Agricultural Industrialization, Agricultural Risk Management and Insurance with China Access to WTO and the development of poultry industry in Hebei province. Besides, he has remained the Vice President of Baoding Price Society, member of American Rural Sociological Society, Director of the Association for Soft Science of China. Dr. Abdur Rehman, the second author of this book, was born in District Chitral, on 11 th April, 1982. He currently works as an Assistant Professor, in the Department of Agricultural Economics, Faculty of Agriculture, Gomal University, Dera Ismail Khan, Khyber-Pakhtunkhwa Province-Pakistan. He completed his B.Sc (Hons) and M.Sc (Hons) degrees in Agricultural Economics from the University of Agriculture Peshawar-Pakistan in 2004 and 2006 respectively. From February 2006 to September 2011, he worked as a Business development officer in Khushhali bank limited Pakistan, from September 2011 to October 2012, he taught as a lecturer of Economics in Institute of Business and Management Sciences, the University of Agriculture Peshawar-Pakistan. Besides, he completed his Ph.D in Agricultural Economics and Management from the Agricultural University of Hebei, Baoding P.R.China in 2015. He has published 9 research papers in the national and international journals. This book totally focused on the agricultural production and market risk, the affects on agriculture and farmers after China joining WTO. And also considered the concept of entropy as the important foundation of the risk analysis. It analyzed the agricultural risks existed real background in natural and market of China. Concentric and scope by using modern economics principle and risk management tools and especial using information to reduce uncertainty. It gives the descriptions on risk’s sources and distribution, transferring and dissipation, as the regular patterns. For the first two cases they general belonging to production risk management problems, and the last case should let risk market to make up. 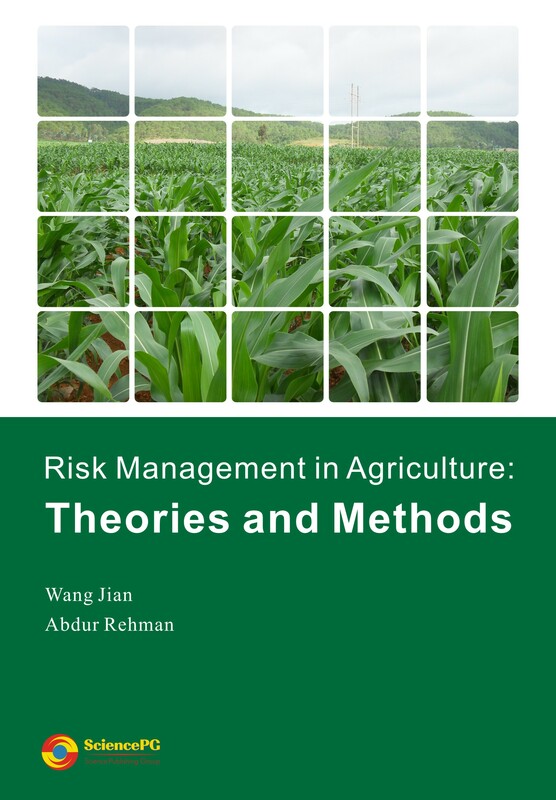 Therefore, the book concentrates on the agricultural production risk management to agribusiness risk management, so that it finally suggested to design a macro risk management system and a construction of global agricultural risk management system.